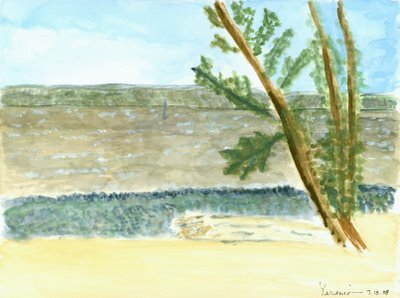 Yesenia and I spent the afternoon making dueling watercolors of the Hudson River, as viewed from a Haverstraw park full of such views, as well as plenty of Orthodox Jews and Hispanics, meaning that Yesenia and I fit in perfectly. I really felt my race-pride kick in when a Jewish mother came over to look at our paintings, and asked if we were doing them for money. I vastly prefer Yesenia's, both for her softer, less insistent textures and her more well-observed palette. Yesenia definitely nailed those colors - the sickly green/brown of the river, like the color of a rec-room carpet from 1974 and the pale swirl of the sky. When I started mine - from the top down, of course - I had it in mind that I might actually be making a comic out of it, so naturalistic color was pretty far from my mind. Which is really a poor excuse. The truth is that my color eye is terrible, and on top of that, my use of color is always timid, so I decided for better or worse to really go at this painting - regardless of its final form - with a full-on color approach. Naturally, I lost my resolve about five minutes in, which is why the rest of my palette is so subdued. Oddly, I thought I was getting the colors somewhat right, for a change... and then about three-quarters of the way through the painting, I made the mistake of taking off my sunglasses. Yeeks. Let that be a lesson to you: never paint with UV protection on your eyes. 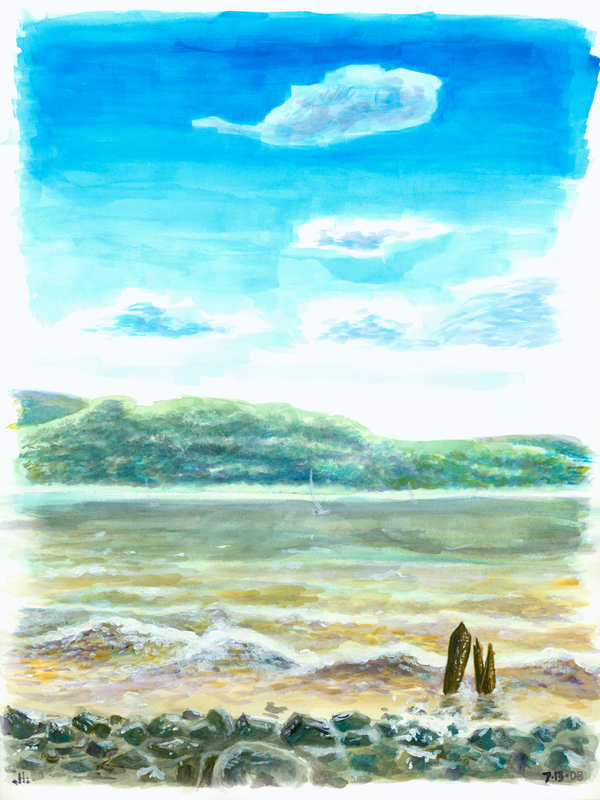 There's a new Vomit Comic up on a similar theme (either today or tomorrow, depending on when they post it), and my painting makes another appearance over there, as supplemental material, and slightly more commentary. Do drop in. Actually, it's an old Vomit Comic, one that was posted on the Rambler over a year ago - but now it has expanded commentary, for those who live for yet still more Rambling. BTW: Tonight's Rambler title is actually a deep-reference private joke. Anyone get it? Ansley and Bran, I'm mostly looking at you on this one. BTW, BTW: This is Rambler number 400. Keep on Chooglin'!